By the early 70s the big city cry ballad was largely a thing of the past – but there was the occasional last hurrah like this one from the obscure Samuel E Wright. 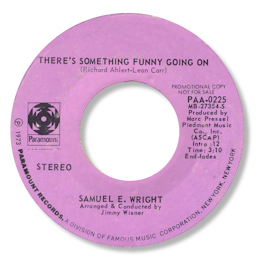 There’s Something Funny Going On is right in the bag of artists like Roy Hamilton as Wright’s immense, demonstrative tones show so clearly. Arranger Jimmy Wisner fills the track with an enormous New York orchestra like it was still 1963 rather than a decade later. This is one that grows on you. The flip is a nice version of a Tony Joe White song. UPDATE ~ My great friend Greg Burgess writes with more info on Samuel E Wright's career which you can read about on his Wiki entry here. There is so much more to him than a solo 45 on Paramount - sadly most of it passes way outside the scope of this website - but his efforts as an actor and singer deserve enormous respect.